Meet, Socialize, Drink, Love, Dance! LIM & Doctor Love are Open Minded Gay Parties. 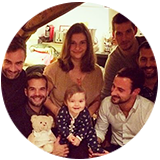 The LIM was born in December 2007 at the initiative of Mylène, Doctor in medicine in her “real life”, she organized monthly evenings in her apartment that she shared with her best friends Nicolas, Thomas, Gianluca, Hubert et Aaron. At the beginning, it was a question of inviting a small circle of friends, most of them gays, and allowing the friends of friends to meet in a festive and friendly atmosphere, but soon the success was at the rendezvous and so were the troubles with the neighbours! It was time for Mylène and her friends to organize collectively and move the evening in a more spacious place, without losing any of its good-natured charm. The first LIM was opened to the public in December 2008 in Tea Dance format on Sunday, in a bar on rue Saint Sauveur. Word of mouth continued to go on and the LIM had to change places regularly to adapt to the constraints of exponential growth. It is at Les Planches that the collective LIM has finally set its sights, its different spaces and its configuration approaching that of an apartment and thus keeping the “LIM” spirit. Thanks to its success and experience, the team has grown considerably, which has resulted in the emergence of a new club-oriented evening one Saturday each month: the “Doctor Love”, an evening now as expected as the Tea Dance thanks to a strong concept, a grandiose decoration and a theme constantly being renewed! Espace de partage, de fête et de liberté, la LIM c’est votre divertissement du Dimanche soir avec son Club et son Karaoké pour varier les plaisirs. Fréquence: Un Dimanche par mois de 20.00 à 01.30 aux Planches Paris. Musique: Vintage pop, new hits, and all time classics. A space for sharing, partying and be free, the LIM is your Sunday evening entertainment with its Club and Karaoke to vary the pleasures. Frequency: One Sunday per month from 08:00pm to 01:30am at Les Planches Paris. Music: Vintage pop, new hits, and all-time classics. Une atmosphère unique à Paris et loin des clichés! laughter… A unique atmosphere quite far from clichés! Frequency: One Saturday per month from 11:30pm to 06.00am at Club Haussmann Paris. Music: Fresh Pop, House, Club classics, Rnb & Some remixes.